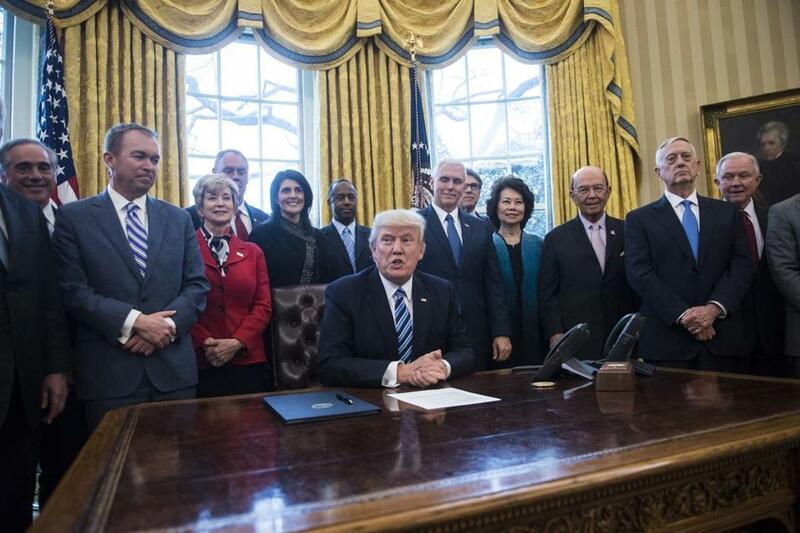 Donald Trump in the Oval Office with members of his Cabinet last March. This column is adapted from the current issue of Truth and Consequences, Michael A. Cohen’s weekly online newsletter. To subscribe, click here. Late last year, HHS Secretary Tom Price was forced to resign over reports that he charged taxpayers $400,000 for official travel on military and private jets. Charging taxpayers for plane rides that officials previously conducted on cheaper, commercial flights has become practically de rigueur in the Trump Cabinet. For example, last month The Washington Post reported that EPA administrator Scott Pruitt regularly flies first class or uses military jets. The EPA said he did so because of security concerns and claimed that he has a blanket waiver from the department to fly first class. He doesn’t. Treasury Secretary Steve Mnuchin, who has a net worth of close to $300 million, charged the government $800,000 for travel on military jets and even requested military transport to go on his honeymoon last year. At least we finally know what Ben Carson has been up to: Shopping! The chief of staff to Secretary of Veterans Affairs David Shulkin was forced to resign after an inspector general report found that she doctored an e-mail and made false statements to ethics officials regarding official travel for Shulkin and his wife. She was seeking to create a pretext for the agency to foot a $4,300 bill for Shulkin’s wife to join him on a 10-day junket to Europe last year, which included tickets to Wimbledon and trips to tourist destinations in the United Kingdom and Denmark. Then there are the sins of omission. Commerce Secretary Wilbur Ross failed to reveal in his confirmation hearings that he has a significant investment in a shipping company with close business ties to both a Russian oligarch and the son-in-law of Russia’s president, Vladimir Putin. Attorney General Jeff Sessions hasn’t engaged in financial wrongdoing, but it seems clear that he may have perjured himself on multiple occasions during his confirmation hearing to become the nation’s highest ranking law enforcement official. 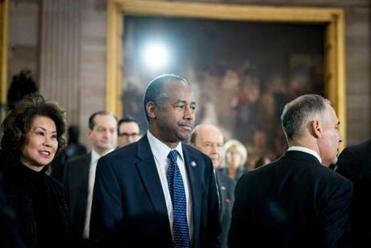 We can also give a shout-out to Education Secretary Betsy Devos, who instead of using the department’s in-house security has tasked US marshals with protecting her — at a cost to taxpayers of approximately a half-million dollars a month. But the granddaddy of them all is Interior Secretary Ryan Zinke. Like other Trump Cabinet secretaries he’s charged taxpayers for trips on private planes. He’s also attended political fund-raisers as part of his official travel, reportedly used funds set aside for wildfire preparedness to take a helicopter trip to Nevada, which was unrelated to wildfire preparedness; and allegedly threatened Alaska’s two senators, Lisa Murkowski and Dan Sullivan, to withhold Interior support for Alaska before the Senate vote on repealing Obamacare. Finally, Zinke has the staff at the headquarters of the Interior Department raise and lower a flag depending on whether he’s in the building — which is less an example of corruption and more just a useful piece of insight into how Trump’s Cabinet members view the humbling responsibilities of public service. An honorable mention must also be given to Secretary of State Rex Tillerson, who has avoided enriching himself and instead has been content in eviscerating the State Department’s bureaucracy since he took over the agency last year. These are just the Cabinet officials. There’s also the former national security adviser, who pleaded guilty to lying to the FBI; the White House staff secretary credibly charged with domestic abuse; and the head of the Centers for Disease Control, who was caught trading stocks in companies that had business before her agency and was forced to resign. Finally, there is Jared Kushner, the White House senior adviser/son-in-law who not only lacks a full security clearance but who also received $500 million in loans from two investors not long after they met with him in the White House. Of course there’s also the president of the United States, who is personally profiting from being president — and likely violating the Constitution in the process. This kind of venality at the highest levels of the US government has little modern precedent. Indeed, in eight years of the Obama presidency there’s not one scandal that rises to the level of any of the ones mentioned here.